Below you'll find some cool Survivor party games ideas for your kids birthday party. If you have not looked at our Survivor Birthday party ideas, have a look at those ideas too! 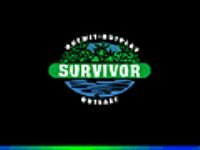 There you will find lots of Survivor Birthday party ideas for decorations, invitations, food ideas and much more. But now scroll down and check out our cool Survivor party games. Sack Relay: Two teams, have the first player one of each team stand in a sack. The first player of each team must hop to the finish line in the sacks, step out of the sack run back to the starting line with their sacks and pass them to the next players in line. The team who does this fastest wins. Egg on the Spoon Relay: Two teams, give the first player of each team a spoon with an egg (hard boiled, but don't tell them this).They have to balance the eggs on the spoons. Have the two first players run with the egg and the spoon to the finish line and then back to the starting line with the spoon & the egg. The team who finishes fastest wins. Orange Relay: Same as above, but the kids have to pass an orange from the beginning to each line to the end using only their chins and necks. If a player drops the orange at any them, she/he must pick it up without using her hands and continue. The team who does this fastest wins. Spicy Eating Relay: Make something really nasty or really spicy, (spicy rice?). Give two big plates of spice rice to each team and lots of spoons. The team who finish the rice fastest wins. Provide lot's of water! Bug or Worm Eating Relay: Each kid have to eat 2 worms or bugs and pass the tray to the next tribe member until they all have eaten two. Go around and ask them to show you their tongues to see that they have really eaten the bugs or worms. Puzzle Contest: Two teams, the team who puts the puzzle together fastest, without having a picture of the finished puzzle, wins. Treasure Hunt: Each tribe has to find one object that is secretly coded in the clues. Each object has another clue that eventually leads them to the treasure chest. Place two of everything along the trails, so that both tribes have the same opportunity. Let each tribe go down different trails, place each object approximately the same distance from the other for both tribes. The tribe who finds the treasure chest first, wins! Moon Walk: Two Teams, the kids have to walk across bubble wrap and not pop any of the bubbles. Once they make it across, next team member goes walking. The team who breaks most bubbles loses. What Is It: Before hand paint some boxes black or green, make two holes in the boxes (for the hands). Fill the boxes with yucky stuff such as eggs with flour, dirt and grass etc use your imagination. The day of the party put small things in the boxes such as a key. Divide the kids into two teams. Provide 4-6 boxes for each team. The contestants have to find an object in the box The team who finds the "things" inside the boxes fastest wins. Limbo Dancing: It's and individual contest! I hope our Survivor Party Games will help you in your planning and I hope your kid will enjoy her Survivor party!